Did you know you can request job accommodations if you have a disability? Even if you have the skills and training to do a job, having a disability can make some jobs unattainable—or unsustainable. But job accommodations, ranging from specialized equipment to adjusting how you do your work, can bring many jobs within reach. Job accommodations, also called reasonable accommodations, are adjustments that allow people with disabilities to participate in a job application process, or to perform the essential functions of a job. There are a wide variety of types of accommodation, and they vary based on the type of job and a person’s unique needs. Restructuring the job. Involves changing when or how tasks are performed. Modifying work schedules. This may allow an employee with a disability to handle medical appointments or medication schedules, get needed rest, etc. Acquiring or modifying existing equipment or devices. For example adjusting a desk height for wheelchair access, or providing an employee a mouth stick device to type on their computer. Providing assistive technology or devices. Examples include computer screen readers for employees with visual impairments, or a telephone compatible with an employee’s hearing aid. Adjusting or modifying tests and training materials. Includes providing materials in alternate formats, such as braille, CD or large print. Who qualifies for job accommodations? Employees and applicants may either qualify under a federal law, or more informally, by requesting accommodations that are acceptable to an employer. The Americans with Disabilities Act of 1990 (ADA) requires employers to provide reasonable accommodation to qualified employees and applicants with disabilities, unless it would create an undue hardship, such as due to cost, disruption, or demands on the workplace. However, since the ADA does not specify which types of disabilities must be accommodated, there isn’t a hard and fast list of who qualifies. You can review the ADA’s definition of what constitutes a disability and find more information from the Equal Employment Opportunity Commission (EEOC), which enforces the aspects of the ADA related to employment. How do you request an accommodation? 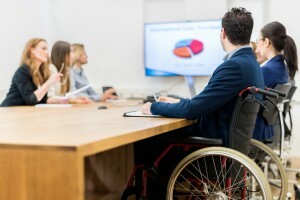 An employee or job applicant is usually responsible for requesting reasonable job accommodations for a disability, but in general, the employer and individual collaborate to choose the best option and make a plan. Although an accommodation request does not have to be in writing, it can be helpful to write up a request for clarity and to refer back to in case of questions or dispute. A letter could: specify that your request is in reference to the ADA, identify any tasks that are an issue, list accommodation ideas you and the employer have suggested, and note medical documentation you may have. Job accommodations can not only help people with disabilities open up employment options, they can also provide employers with access to a pool of talented employees. Learn more about accommodations and other resources for job applicants and workers who have disabilities on CareerOneStop.